The dance derives its name from the fisher folk of Western Maharashtra & Goa - Kolis, who are noted for their distinct identity and lively dances. Their dances incorporate elements they are most familiar with - the sea and their occupation of fishing. 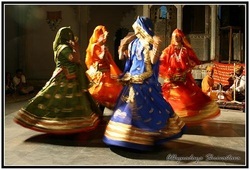 The dance is performed by both men and women - divided into two groups. The smaller group of men and women, in pairs, enact the main story of the dance - where the Kolin or fisherwoman makes advances to the Koli or fisherman. 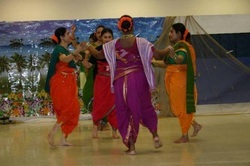 The larger group, also in pairs, forms the backdrop for the story, dancing in a looped movement that depicts the rowing of a fishing boat on undulating waves. Especially most of the dances and celebrations are devoted to "Sea God" for a better catch and protection.